This group of exercises uses a mix of well logs, seismic, and outcrop data to interpret carbonate sections with data from the Permian basin of West Texas and New Mexico. The column to the right has thumbnail images that provide links to both images that provide background data needed to interpret the well logs and the seismic section and to .pdf files that can be downloaded to a printer to execute the various exercises associated with Permian basin. The basic model used in these exercises is the Harris & Saller, (1999) interpretation. 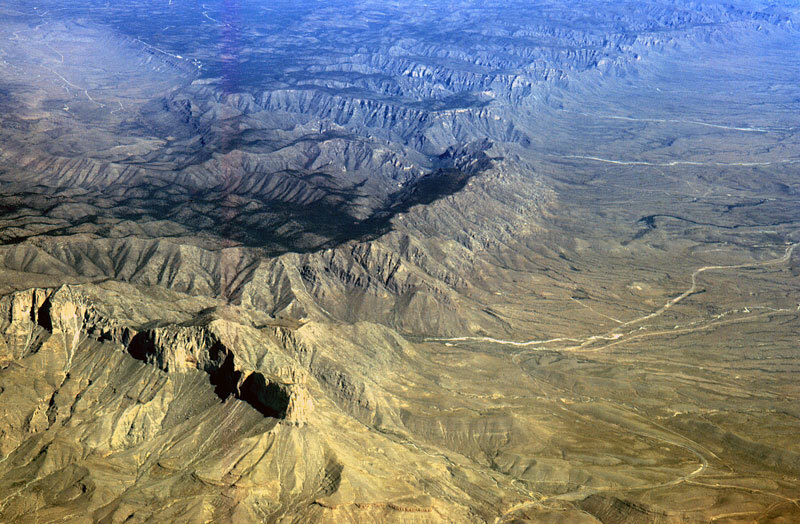 The Permian carbonate shelf and reef margin complex of West Texas and New Mexico of the Delaware basin which outcrop in the Guadalupe Mountains have been the target of extensive exploration for hydrocarbons. A mix core, well log sections, field observations and seismic have established that the eclectic depositional facies of this region cover a wide range of settings which have responded to changing sea level and carbonate productivity. The figure below by Beuabouef et al, (1999) captures some of the diversity of this carbonate margin as it evolved. 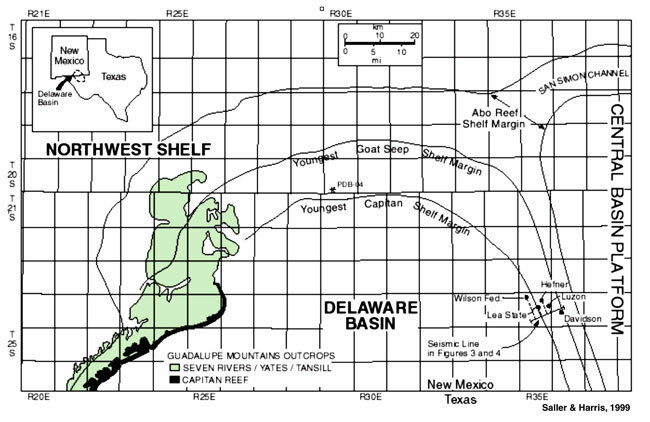 So during late Leonardian time the Northwest shelf of the Delaware basin consisted of a relatively low angle prograding fine grained shelf to ramp to basin transition that included the updip Victorio Peak and the down dip Bone Spring limestone. During Gudalupian time the earlier Leonardian high stand systems tract carbonate sediments were overlain by, incised into and onlapped by the low stand Brushy and basal Cherry Canyon of largely deeper water clastic sandstones that downdip form basin floor fan complexes. Up dip the time equivalent sedimentary system was the low relief prograding San Andres carbonate ramp. 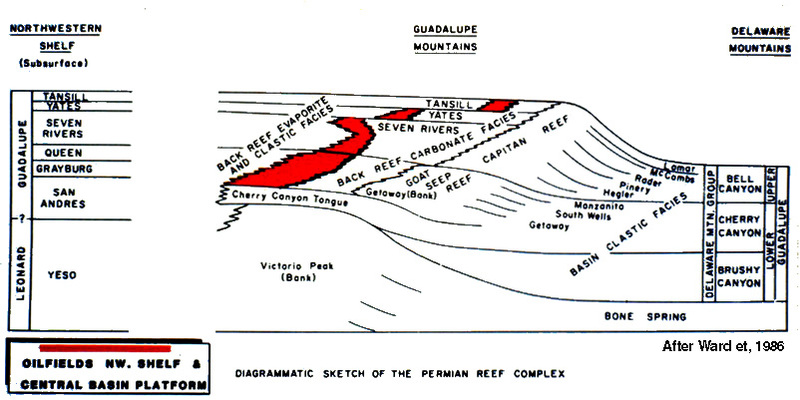 Through the rest of Guadalupian time sedimentary section captures the beat of varying sea level with clastics by passing and capping the carbonate margins during sea level lows while the carbonate bank systems progressively thickened and steepened as they stepped seaward during the seal level highs. Down load the un-interpreted well log section (Ex-01) from Texas that dissects the North Eastern margin of the Delaware Basin. The map locating this well log section is provided. Use a mix of your understanding of the Permian Basin from the panoramic view of the basin and the cross section drawn by Beaubouef et al (1999) and the well log section exercise to build an interpretive geological model. 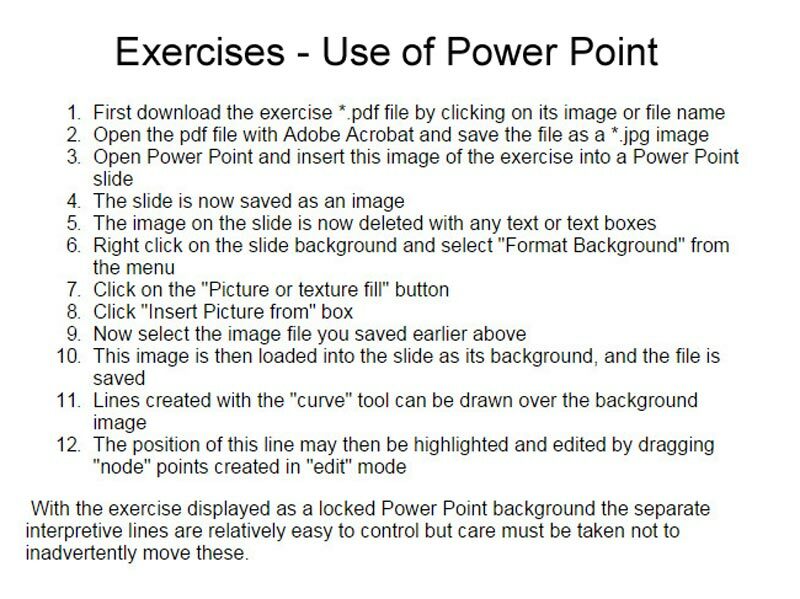 A pdf file can viewed on your Laptop PC, Notebook, Tablet, or Pad and interpreted with Power Point drawing tools, particularly the curve. This methodology is an effective and easy way to handle the objectives of the exercise and a means for collective viewing of results in class. Click on red box for more details. The output can be also be printed, and solved on paper. To build this interpretive model your first task is to correlate the character of the Gamma Ray well logs from well to well. As with the earlier exercises associated with the Syldavian basin, you should see if you can establish patterns of coarsening or fining upward cycles and link them from well to well. Draw arrows on the exercise print out to indicate the grain size variation and so mark patterns of shoaling or deepening upward in character. As before an arrow inclined to the left would indicate that the grain size is coarser and that the water became shallower while an arrow that is inclined to the right would indicate that the grain size is finer and so the water became deeper. You will probably find that to use of these well logs alone to correlate between the sections is confusing. I contend that it would be hard for even the most experienced geologist and sequence stratigraphers to correlate the well logs. The reason for the ambiguity in the character of these well logs is that carbonates in the section have an extremely variable character and are interbedded with both clastics and in some cases with evaporites both down and up dip. Also in addition to having varying lithofacies the carbonates of this section have tended to have become cemented and/or leached thus changing their petro-fabrics and obscuring signals that might used to indicate grain size change as they do in clastic rocks. The way round this problem is to aid the interpretation of this section through the calibration of well log character with the seismic section that parallels the well log section. First down load the un-interpreted seismic section that parallels the well log section (Ex-02-Seis UnInt) and the synthetic seismic trace for the Davidson Federal #1 well that has the major stratigraphic units penetrated by this well identified on it (Synthetic). Examine the synthetic and look for similarities between the reflector characters and that of the seismic section at the location of the Davidson Federal #1 well. Where these reflectors coincide with major stratigraphic tops like that between the Salado formation and underlying Tansill formation or between the Tansill formation and the underlying Yates Formation, etc., these should be indicated on the seismic cross section and traced regionally across this line. Now download the partly interpreted well log section from Texas across the North Eastern margin of the Delaware basin (Permian-Ex-02). Use your interpretation of the seismic line mixed with an understanding of the Permian basin from the panoramic view of the basin and the cross section drawn by Beaubouef et al (1999) and this well log section build an interpretive model. Again your task is to correlate the character of the Gamma Ray well logs from well to well establishing the patterns of coarsening or fining upward cycles and linking them from well to well. As before an arrow inclined to the left would indicate that the grain size is coarser and that the water became shallower while an arrow that is inclined to the right would indicate that the grain size is finer and so the water became deeper. Using the calibration of well log character with the seismic section that parallels the well log section should make this task somewhat easier and the data gathered this way is getting closer to that needed to make a sequences stratigraphic analysis from which it should be possible to predict the geometry and extent of carbonate lithofacies. First down load the interpreted seismic section that parallels the well log section (Permian-Ex-02-SeisInt) on which the major stratigraphic tops are indicated on the seismic cross section and traced regionally. Now download the more completely interpreted well log section from Texas across the North Eastern margin of the Delaware basin (Permian-Ex-03). Use the interpretation of the seismic line mixed with your understanding of the Permian basin from the panoramic view of the basin and the cross section drawn by Beaubouef et al 1999 and this well log section to build an interpretive model. Again your task is to correlate the character of the Gamma Ray well logs from well to well establishing the patterns of coarsening or fining upward cycles and linking them from well to well. As before an arrow inclined to the left would indicate that the grain size is coarser and that the water became shallower while an arrow that is inclined to the right would indicate that the grain size is finer and so the water became deeper. Using the calibration of well log character with the interpreted seismic section that parallels the well log section should make this task somewhat easier and the data gathered this way is getting closer to that needed to make a sequences stratigraphic analysis from which it should be possible to predict the geometry and extent of carbonate lithofacies. To the completely interpreted well log section from Texas across the North Eastern margin of the Delaware basin link to Permian-Ex-03 Solution. This later solution would be improved if you were able to use a combination of cores and logs. Beaubouef, R. T., C. Rossen, F. B. Zelt, M. D. Sullivan, D. C. Mohrig, and D. C. Jennette, 1999, Field guide for AAPG Hedberg Field Research Conference: deep-water sandstones, Brushy Canyon Formation, West Texas, April 15-20, 1999, Tulsa, Ok, AAPG, p. 99. Borer, J.M., and Harris, P.M., 1991, Lithofacies and cyclicity of the Yates Formation, Permian Basin: implications for reservoir heterogeneity: American Association of Petroleum Geologists Bulletin, v. 75, p. 726-779. 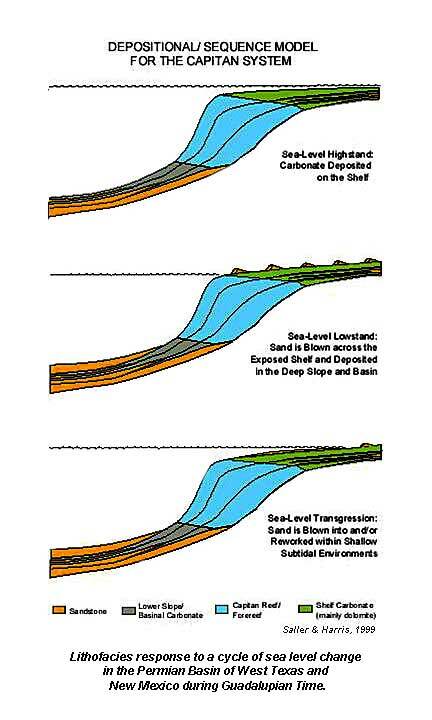 Harris, P.M., and Saller, A.H., 1999, Subsurface expression of the Capitan depositional syst and implications for hydrocarbon reservoirs, northeastern Delaware Basin, in Saller, A.H., Harris, P.M., Kirkland, B.L., and Mazzullo, S.J., eds., Geologic Framework of the Capitan Reef: Tulsa, OK, SEPM Special Publication No. 65, p. 37-49. 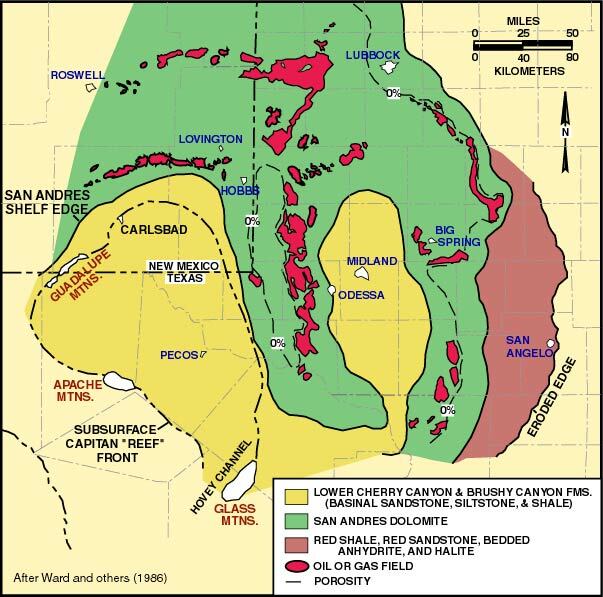 Ward, R.F., KendallL, C.G.St.C., and Harris, P.M., 1986, Upper Permian (Guadalupian) facies and their association with hydrocarbons Permian Basin, west Texas and New Mexico: American Association of Petroleum Geologists Bulletin, v. 70, p. 239-262.